Visually check for proper installation, damaged/deteriorated components, or foreign objects within mechanism. Correct as required for smooth operation. Check for grease at the wind deflector arm (1) and pivot areas. If necessary, apply a sufficient amount of grease for non-binding operation. Check that the wind deflector (1) moves freely within the moonroof unit assembly while manually pressing down and releasing. If a malfunction is detected, remove the moonroof unit assembly and visually inspect. If damage is found, replace either wind deflector (1) or moonroof unit assembly as required. Refer to RF-49, "Removal and Installation" (WIND DEFLECTOR) or RF- 45, "Removal and Installation" (MOONROOF UNIT ASSEMBLY). Before replacing a suspect part, make sure it is the source of noise being experienced. Check link to determine if coating film has peeled off excessively enough that substrate is visible. Check also to determine if link is the source of noise. Replace as necessary. Visually check to determine if a sufficient amount of grease has been applied to wire or rail groove. If not, add grease as required. Check wire for any damage or deterioration. If any damage is found, replace moonroof unit assembly. Refer to RF-45, "Removal and Installation". Visually check weatherstrip for damage, deterioration, or deformation. Open glass lid partially to inspect front edge of weatherstrip. Tilt up glass lid fully to inspect sides and rear edge of weatherstrip. If any area of the weatherstrip is found to be damaged, replace the glass lid. Refer to RF-39, "Removal and Installation". Check for leakage around glass lid. Pour water around surface to determine area of concern. For gaps or misalignment, adjust glass lid to specifications. Refer to ADJUSTMENT in this section. For damaged sealing surfaces, either replace glass lid, refer to RF-39, "Removal and Installation" or repair the panel, refer to BRM-34, "Roof". Remove the headlining. Refer to INT-40, "Removal and Installation". Proper connection at moonroof unit assembly and drain hose. Damage, pinch, cracks or deterioration. Pour water through drain hoses to determine watertight performance. If damaged or leaking portions in any drain hose is found, replace entire drain hose as necessary. After installing either moonroof unit assembly or glass lid, check gap/height adjustments and operation to make sure there is no malfunction. Always work with a helper. Handle glass lid with care to prevent damage. When taking moonroof unit assembly out, use shop cloths to protect the headlining, seats and trim from damage. For easier and more accurate installation, always mark each point before removal. Before servicing moonroof unit assembly, turn the ignition switch off, disconnect both battery terminals and wait at least three minutes. Disconnect the harness connector from the moonroof motor assembly. Remove moonroof side bracket bolts, then the moonroof side brackets (LH/RH). Remove ten nuts around the roof opening from the moonroof unit assembly. Remove moonroof unit assembly from the passenger compartment while being careful not to damage the seats and trim. Position moonroof unit assembly over locating pins and loosely install ten nuts around roof opening. Install side brackets (LH/RH) and loosely tighten bolts. Tighten the moonroof unit assembly nuts diagonally. 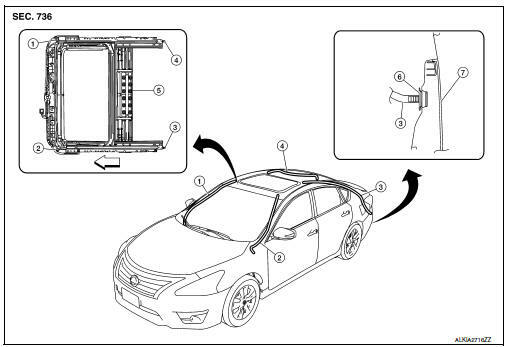 Tighten the moonroof side bracket (LH/RH) bolts at the vehicle side first, then at the moonroof side rail. Connect harness connector to the moonroof motor assembly. Check the glass lid adjustment. Refer to RF-40, "Adjustment". Install the headlining. Refer to INT-40, "Removal and Installation".